There are many wonderful vegetables from the fall garden. Fall vegetable gardens are a great opportunity to grow those cool-weather crops that you couldn't enjoy in the spring. You can also plant more of the spring crops that you enjoyed but didn't get quite enough of. Many people think that once fall arrives, gardening season is over. That isn't the case! Fall is a wonderful time for tasty, cool-weather crops. Those who live in warmer climates often miss out on these crops because the summer heat arrives too soon for their vegetable to fully mature. In hotter climates, fall is the time to start vegetables that the rest of the country grows in the summer. Gardeners in south Florida, for example, first start their tomatoes in the fall, about the time the rest of the country has picked their last tomatoes of the year. Perfect vegetables for northern fall vegetable gardens will depend on the first frost of the season. You will want to consider the days to maturity before deciding which vegetables to plant. If the plant tag or seed packet indicates that you will be able to harvest before the average first frost for your area, you have a winner. 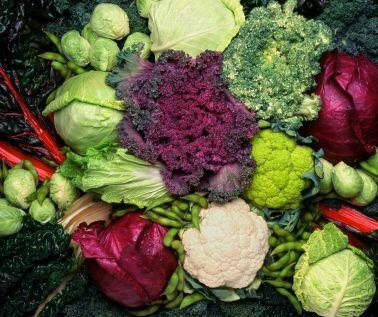 Some excellent choices include cole crops such as Brussels sprouts or cabbage. Turnips, kale, parsnips and collards can also be grown, from transplants, in the northern fall garden. These vegetables actually improve in flavor if allowed to be touched by frost. You will notice they taste sweeter. Other great crops for your fall garden include spinach and lettuce which thrive in cooler temperatures. Carrots, peas and radishes will also do well as the temperatures cool off in the fall. These crops can be planted from seed. Southern vegetable gardens in the fall grow some of the same vegetables as their northern counterparts. Brussels sprouts, kale, collards, spinach, lettuce and radishes all do well in the fall. Onions can also be planted in the fall and can continue to be harvested until the first killing frost. In the deep south, fall is the time to plant tomatoes and peppers. This is the time when south Florida commercial farmers produce the vegetables that you find in the grocery store. Home gardeners in south Florida grow their summer favorites during the fall and winter as well as the commercial growers. If you get a late start and worry that your fall-planted veggies may not mature in time for the first hard frost, consider using season extenders to help them along. Row covers, cloches, cold frames, hot caps and even greenhouses will give your garden the extra warmth it needs during the chilly days of late fall and early winter. With careful planning, you can extend your garden season an extra month or even two months! You may be able to harvest fresh vegetables to enjoy for your holiday meals, much to the delight of your family and friends. You can even create your own season extenders in a pinch. Expecting a light frost? Throw a sheet or light blanket over delicate crops. Be sure these covers are tied down somehow or they could end up in the neighbor's yard if it gets too breezy. Try some bricks or rocks on the edges to create an anchor. If you are using material that won't be reused in the house--old sheets for example--you can even get some inexpensive tent stakes and push them right through the fabric and into the ground to keep it from blowing away. Just remember to remove the cover during the day when it's sunny or you could kill your vegetables. You can also make mini-greenhouses with two-liter soda bottles or gallon milk jugs. Just cut off the bottoms and place them over each individual plant. This trick has the added advantage of ventilation on warmer days. Just take off the cap on the jug or bottle so your plants don't get too hot on sunny days. Both of these methods allow you to grow fresh vegetables longer into the season without spending a fortune on commercial season extenders. One final benefit of planting fall vegetable gardens is that you'll spend less time longing for spring. If your garden season is longer, it stands to reason that your down-time is shorter. Of course, you'll still have just enough time to drool over seed catalogs and plan your spring garden.